Nestled among the lush tropical foliage, Largo Lodge offers relaxation, Keys style. Located on the Gulf of Mexico with a private beach, Largo Lodge is the place to get away. Start your Florida Keys vacation off right by making Largo Lodge your Keys destination. In just minutes, guests can find themselves in the finest fishing and diving waters. John Pennekamp Coral Reef Park, less than a mile from your room, is the premiere coral reef diving location. Find yourself relaxing on the dock viewing spectacular sunsets. Free parking. 60 channels of cable TV. 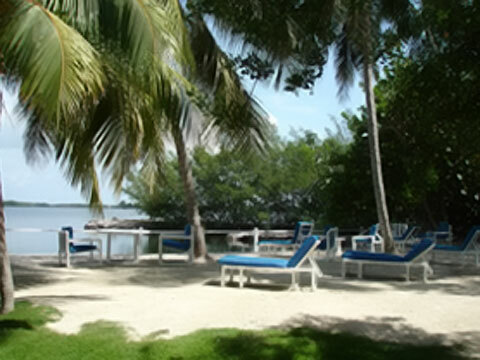 ACCOMMODATIONS Largo Lodge consists of 6 cottages and 1 room, located on 3 beautiful acres bayside. Cottages Your air-conditioned unit has a living room, one bedroom with two queen beds and a combination kitchen / dining area. All units are located in our garden -- a short distance from our sandy beach and waterfront. We have a 100-foot dock for swimming, relaxing and watching beautiful sunsets. Room Regular motel room â€“ small efficiency - with one queen bed and private bath.